The man who founded Toys R Us - the children's toy retailer - has died aged 94, one week after his company announced it was closing its doors. Charles Lazarus began selling toys in 1957 in large supermarket-style shops after he returned from World War II military service. His death comes after the company announced it would close all US and UK shops and seek bankruptcy protection. The "heartbreaking" news of his death was tweeted on Thursday by the firm. 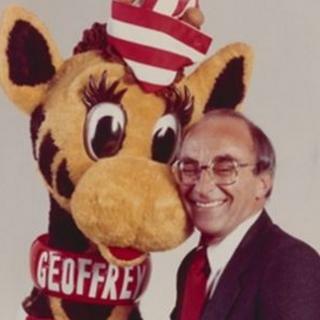 "There have been many sad moments for Toys R Us in recent weeks, and none more heartbreaking than today's news about the passing of our beloved founder, Charles Lazarus," the company wrote online. In a press release, Toys R Us said he had been in "declining health" and that "we will forever be grateful for his positive energy, passion for the customer and love for children everywhere". Earlier on Thursday, the company announced it would suspend the liquidation sales of hundreds of its stores due to "unforeseen circumstances". In a 2008 interview with Entrepreneur magazine, Lazarus explained that he opened the business because all of his military friends were telling him the same thing as they returned to the US following the war. They were all saying they were going back to get married and raise children, which gave him the idea to first begin by selling children's furniture. After returning to his family's home in the Washington DC suburbs in 1948, he converted his father's bicycle shop into a furniture business called Children's Supermart, with the letter 'R' spelled backwards. He later explained that the R was made to make the title of the business look as though a child had written it. The backwards R was also famously used in the name of Toys R Us. Lazarus later moved on to toys and games, saying that "toys are a great kind of thing to sell, because they don't last that long". Before the founding of Toys R Us, the market for children's toys was mostly considered to be a seasonal industry. A 1986 profile in the Atlantic Monthly magazine called Lazarus "the person most responsible for loosening Santa's grip on the toy business". Toys R Us sold nappies at steep discounts, hoping parents would pass the savings along to their children, according to Bloomberg. The company has struggled since Lazarus left in 1994, as the rise of online shopping kept more and more families from visiting the shops. Last week the company announced it would close all of its remaining locations in the US, just a week after announcing it would do the same for its businesses in the UK.